The Combination bit works on both nose pressure and leverage. 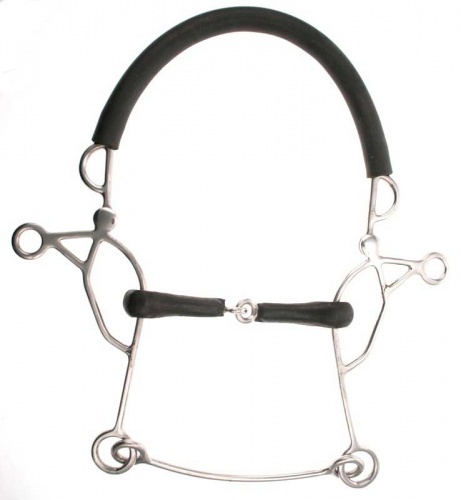 This Abbey England bit is a combination of the American gag with a German-style bitless bridle (hackamore) with a jointed vulcanite mouthpiece. As the rein contact is taken up, pressure is brought on the nose, back of the jaw and then the poll. This gives a steadying lowering signal, before any contact is made with the mouth . The metal structure of the American "gag" Leverage bit inflicts a more severe action. The lowering poll pressure is quite strong as is the lifting (sliding) action on the corners of the lips while leverage pressure presses downwards on the horse's bars, tongue and mouth and when combined as in this bit the result is an extremely severe bit, even if used with the softer option of two reins. Often used by show jumpers a bridle such as this will only be successful when used sympathetically in the hands of the most skilled, balanced and educated of riders.